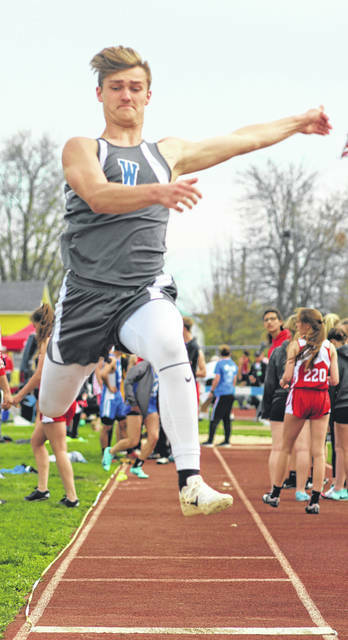 Eli Lynch placed third in the long jump for Washington at the Blue Lion Invitational Friday, Apri 12, 2019. 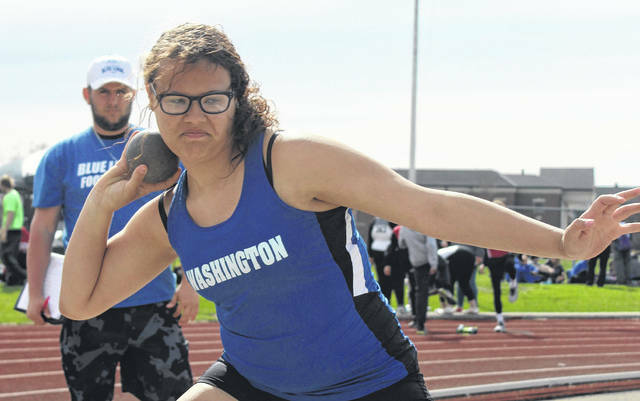 Gabby Whitelow competes in the shot put event for Washington at the Blue Lion Invitational Friday, April 12, 2019. 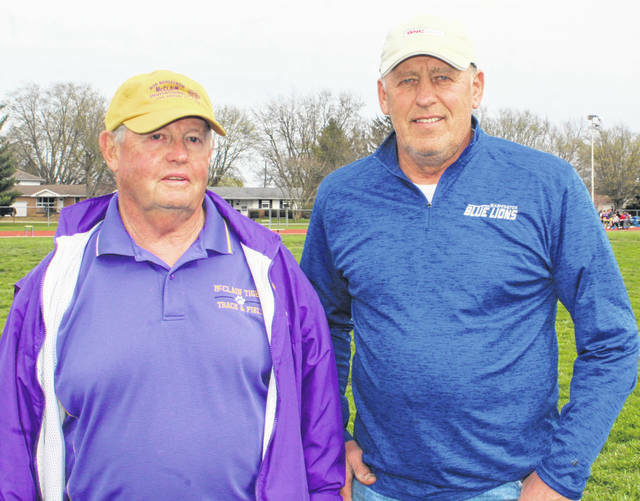 Two veteran track coaches, Bob Bergstrom of McClain, left and Tim Walters, former head coach of the Washington program, were on hand for the Blue Lion Invitational Friday, April 12, 2019. The Washington Blue Lions held their annual track invitational Friday, April 12. The Blue Lions placed third out of 14 teams with a score of 89. Cedarville won with 104 points and Teays Valley was second with 90.5 points. Hillsboro was fourth with 88 points and McClain was fifth with 56 points. Teays Valley won the girls’ meet with 142.5 points. Logan Elm was a distant second with 75 points. Zane Trace was third with 74 points, followed by Circleville with 65 and Washington in fifth with 61. Hillsboro was sixth with 49.2 points and McClain was eighth with 45.2 points. For the Blue Lions, Trent Langley won the 110-meter hurdles in a time of 16.06. He placed third in the 300-meter hurdles with a time of 44.04. Washington’s 4 x 100-meter relay team, comprised of Jamie McCane, Langley, Garitt Leisure and Eli Lynch was second in 46.48. Lynch was third in the long jump with a leap of 18’ 7”. The 4 x 400-meter relay team of Brice Cartwright, Kameron Morris, Lynch and Langley placed 2nd in 3:42.03. Bryce Coy placed second in the pole vault, clearing 11’ 6”. Sterling Smith was third in the discus throw with a distance of 127’ 2”. He was fourth in the shot put with a throw of 46’ 6”. Miguel O’Flaherty was fourth in the long jump at 18’ 6”. In the girls’ meet for Washington, Cloe Copas won the 3200-meter run in 12:17.47. She was second in the 1600-meter run with a time of 5:37.42. Chloe Lovett was fourth in the 100-meter hurdles in a time of 18.02. Lovett, Tabby Woods, Arianna Heath and Halli Wall combined to place second in the 4 x 100-meter relay with a time of 55.24. Megan Downing was fourth in the pole vault, clearing the bar at 9’ 0”. Washington will recognize its track and field seniors prior to Tuesday’s home meet against Wilmington, which starts at 4:30 p.m.
400-meter dash: Chase Mallow, 16th, 1:00.14; Eli Lynch, 17th, 1:00.61; Ben Harper, 23rd, 1:06.73.